An 18-year-old Miami Trace High School student was critically injured in a one-vehicle accident Thursday evening in the 8000 block of Washington-New Martinsburg Road in southeast Fayette County. 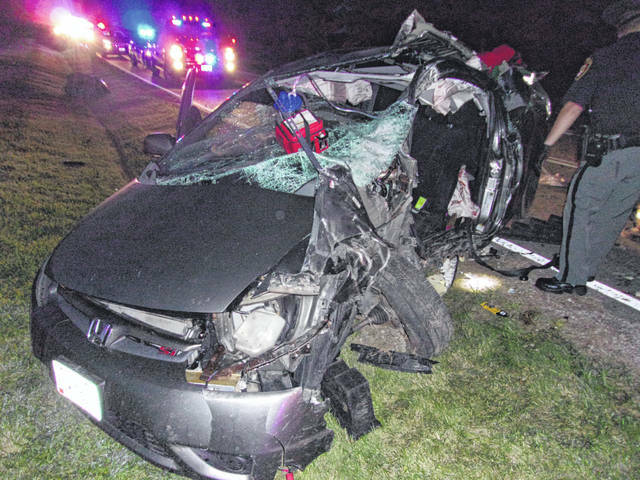 A 2007 Honda Civic, driven by Jacob E. Seyfang, of Leesburg, was heading south on Washington-New Martinsburg Road at around 8:15 p.m. when he went off the left side of the roadway before crashing into a tree, according to Fayette County Sheriff Vernon Stanforth. Following the impact, the vehicle continued across the roadway and off the right side before coming to rest. Seyfang was trapped inside his vehicle before being extricated by members of the Concord-Green Township Fire Department, Stanforth said. He was treated at the scene by members of Fayette County EMS and subsequently airlifted from the scene by MedFlight to Grant Medical Center in Columbus, where he remained in critical condition as of Friday afternoon. Seyfang’s vehicle sustained heavy damage in the crash and was towed from the scene. The cause of the crash is unknown, according to Stanforth, and remains under investigation. Also assisting at the scene were members of the Paint Creek Township Fire Department (Highland County) and the Fayette County Sheriff’s Rescue Unit. Jacob Seyfang, who also goes by Coby Seyfang, is a senior at Miami Trace High School. He is a member of the boys soccer team, boys tennis team, and is active in Key Club and spring musicals. On Friday, Miami Trace Superintendent David Lewis said the thoughts and prayers of the entire Miami Trace community are with Seyfang. Plans were also in place to honor Seyfang at Friday’s Miami Trace Panthers football game.